This is a lovely trip in one of the most protected areas in Crete, very close to the famous Samaria gorge. Previous experience is not required. Starting point is about an hour driving from the town of Chania and is suitable for those staying in west Crete (along with Kalyves trip) and or near Rethymno town. Of course anyone is welcome to join from any part of Crete but check first the driving distance (takes 3 hours from Heraklion). 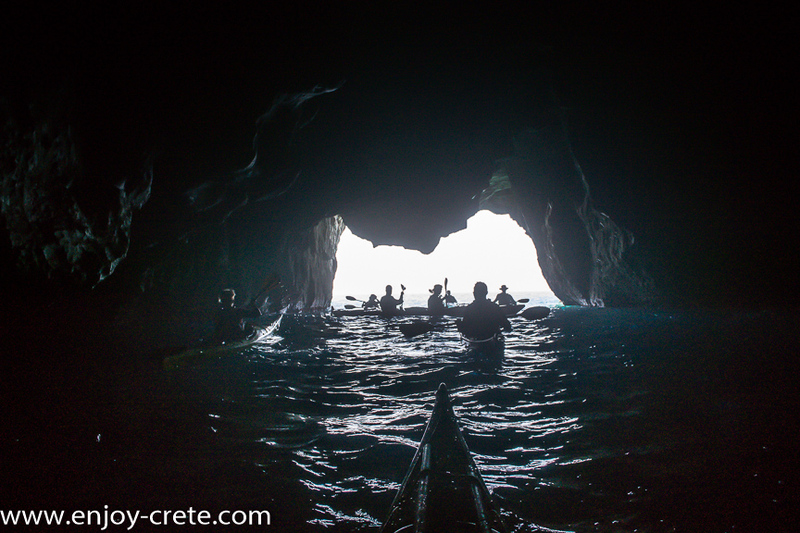 The distance that we will paddle is about 15km and there will be plenty of time for swimming and snorkelling on remote beaches not accessible by cars. All paddling equipment is provided for the trip plus of course the guide. Part of our paddling route. 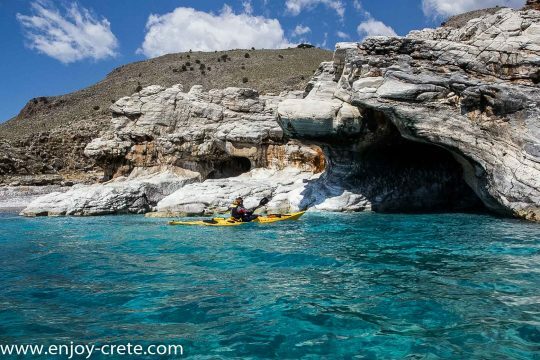 There will be a short introduction to paddling for those that have no experience and afterwards we will start paddling towards Loutro. On our way we will make stops for both; swimming and snorkelling. All stops will be on different beaches. There are sea caves and wonderful beaches for swimming and snorkelling along our way to the small village of Loutro where we will stop for lunch. You can either ear in a taverna or you can bring your own. The food in the village is excellent and there is a wide variety including many recipes for vegetarians. 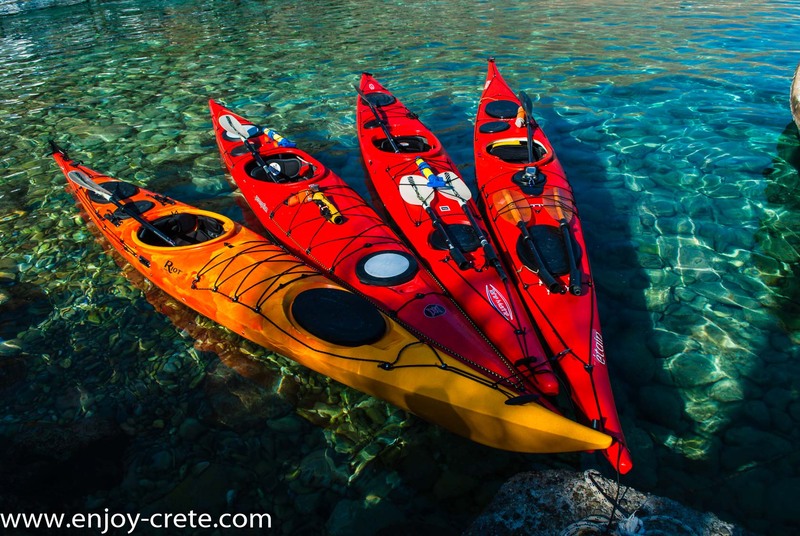 Single or tandem (double) kayaks are available. People with no experience will be given a tandem kayak as those are easier to paddle. Experienced paddlers can get superb boats from Nigel Dennis, Valley, North Shore and P&H. 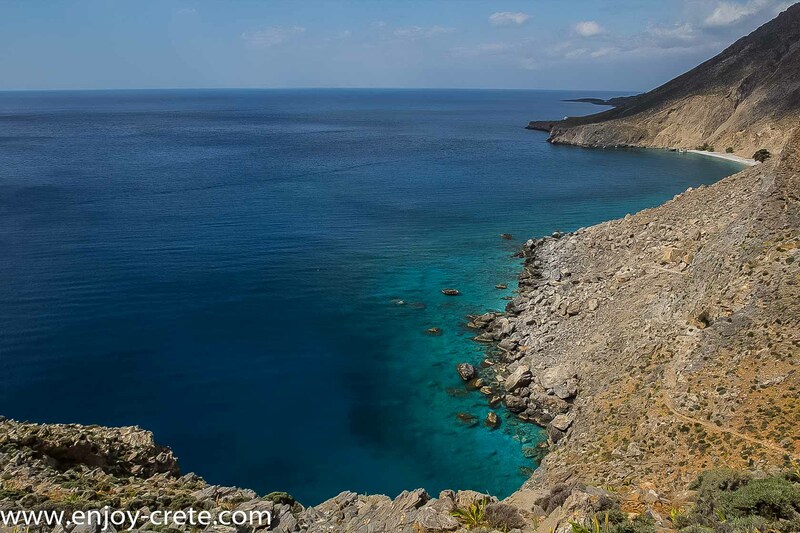 Loutro believed that this was the site of the ancient city of Finikas and was the port of ancient Anopolis. Later, it became the winter time port of the town of Sfakia, due to the fact that the bay and the small island in its entrance create a natural harbour where ships can be safe even at very bad weather conditions. 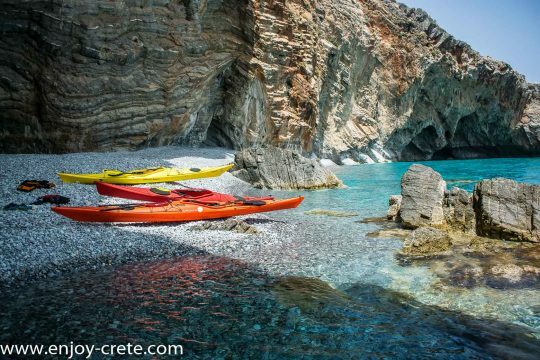 Loutro is most likely the most protected bay for kayak in Crete and is only access by kayak or any other boat plus of course by foot. There are no big hotels with swimming pools and no overcrowded streets, restaurants, beaches and also there are no cars! Check out the following link for the exact meeting point, it is just a few meters before the end of the marina in Chora Sfakion. A five minutes walk from the bus station. We pick up clients from Heraklion and near Rethymno. Many times we are able to pick up clients from other locations as well but it needs to be on our way to the starting point. If you need transport and you are not sure get in touch with us. Remember to send us the exact location of your hotel, not just the name. Transport is provided for free.